The UK is in the midst of a housing crisis. More than 300,000 people are said to be homeless (according to housing charity Shelter), with their numbers growing at a rate of 13,000 a year. In response, the Government recently raised its annual house-building target to 330,000 new homes, though in 2016–17 it still fell far short, at 184,000. But most of the homes currently being built — at least in London — are either luxury apartments sold off-plan to investors abroad who have no intention of living there, or woefully inadequate market-rate housing with a small amount of materially and spatially impoverished ‘affordable’ or social homes. As a direct result of local authority funding cuts, the lack of interest, intelligence or long-term thinking in their skeleton staffed planning departments means that most of the housing targets are being met in tower-block clusters, or edge-of-town mega-developments with no thought to the qualities, amenities or landscaping that might generate any kind of street life or connect the residents to each other, never mind connect these lookalike blocks to the history and atmosphere of the neighbourhoods around them. Why aren’t more architects acting as developers to enrich the range and quality of what’s available? This question has preoccupied architect Roger Zogolovitch for some time. He has even written a book on the topic: Shouldn’t we all be developers? Zogolovitch has been a developer for the past 30 years, latterly through his company Solidspace. Having spent 10 years in practice, at CZWG Architects, he says: ‘I became a developer because I didn’t have enough control over all the elements of what I was doing. I gave up being an architect in my own right, if you like, but I treat development as a creative process.’ Working closely with fellow architects to realise high quality smaller schemes, Zogolovitch’s most recent project was a collaboration with architect Simon Allford (of Allford Hall Monaghan Morris): 81–87 Weston Street, a beautifully detailed scheme of two- and three-bedroomed apartments in South London. London mayor Sadiq Khan does appear to have seen the light, to an extent, having announced the Small Sites, Small Builders programme in February, a plan to free up small plots of publicly owned land around the capital, specifically to encourage the creation of affordable homes. This is good news for the emerging crop of architects who are willing to jump in and build their own projects, as well as a growing breed of small-scale, quality-minded developers. Competition for these small plots is fierce, but opportunities do emerge, especially when architects find creative ways of pulling together the financing or collaborating. 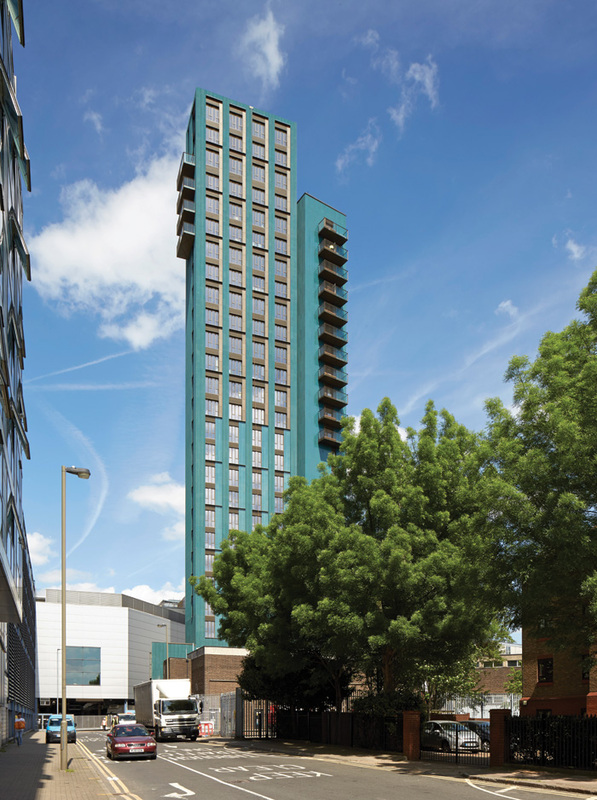 For example, Jo Cowen Architects has started construction on a 15-storey, £18m ‘slender, lightweight’ tower in Battersea, creating 39 homes, jointly funded by the practice as well as emerging developer West Eleven. There are luxury flats — of course — to help fund the proposal, but there is a firm commitment for 30% affordable housing, and the lower three floors will feature 1,500 sq m of serviced office space. As part of the scheme, a new sports hall is being provided, on the site of a former school gym, for the benefit of both the school and locals. Cowen, who worked at Rogers Stirk Harbour + Partners before founding her own practice, talks of the opportunity to create beautiful buildings while also giving back to the local community. Five years ago architect Jake Edgley joined forces with two of his neighbours in Islington (one, Spaced Out Architecture, the other a small developer, CKS Partnership) when the latter spotted that the building between them had come up for sale; they formed a community joint-venture partnership to acquire the site. Planning permission required street-level commercial units, but Edgley and his partners saw that as an opportunity to create five new ground-floor office studios (which the practice inhabits, along with two other companies). Most architects, though, lack the resources to put money up front on a scheme, and for those still wary of developers, a different, collaborative model has been pioneered by Sam Jacob Studio. A former director at FAT Architecture — once dubbed ‘architecture’s biggest pranksters’ — which disbanded in 2014, Jacob has teamed up with the Ivy Street Family Centre in Hoxton. It had inherited a dilapidated Victorian building — formerly a pub — but couldn’t afford to refurbish it. After three years working out the financials and logistics, they recently established an ‘agreement to lease’ the space above the existing community facilities, with the centre retaining ownership of the land. Jacob is now rebuilding an expanded and enhanced version of the original community centre, with a three-storey house for himself on top. Construction has just started on site, and he hopes for a completion next summer. Cohousing and collaborative custom build are also routes opening up for architects to play a far more proactive role. But these are not without their challenges: the financial investment may be shouldered by others, but they require architects with great reserves of patience and an ability to synthesise the requirements of an eclectic customer base, and probably put in far more hours than are financially viable, in order to see the scheme through to fruition. In the current climate, there have to be opportunities for genuine innovation, of a kind that makes good-quality housing faster to build and more affordable. 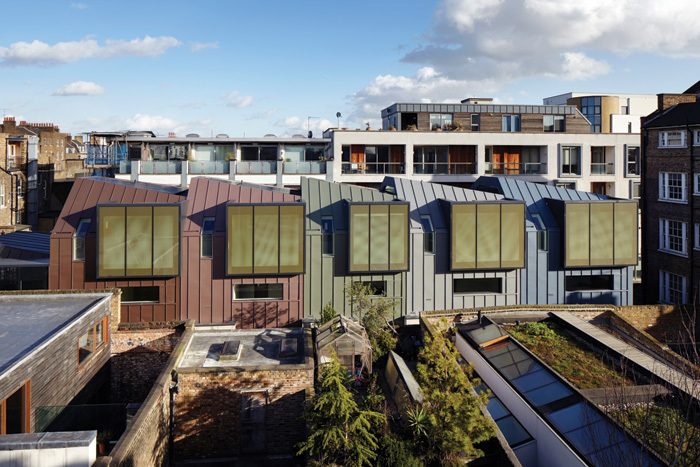 Naked House Community Builders last year joined forces with OMMX Architects to develop an affordable-housing model for London, with homes stripped to their bare essentials (no partition walls, flooring or decorative features). Designed for first-time buyers, the proposed prices range from £150,000 to £350,000 — a good £230,000 cheaper than the average house price. Subject to planning consent, a community of 22 of these homes will be completed in 2020 on a plot of council-owned land in Enfield. While the freehold will be retained by the council, which will receive ground rent from buyers, a resale covenant in the lease keeps the homes affordable in perpetuity. If successful, Naked House wants to roll the model out to other local authorities across London. Modular construction is an avenue being investigated by those offering less space for cost savings. Pocket Living offers 20% cheaper flats for its compact living units — averaging 38 sq m. And, having trialled modular construction with its latest apartments in Lewisham, its first modular tower block, Mapleton Crescent, launched this summer. Longstanding, medium-sized, quality-driven developer Urban Splash has also trialled modular, most recently with a terrace of 10 Fab Houses by TDO Architecture. They were among the first homes to go up in the newly emerging Smith’s Dock development; the disused site of a former shipyard on Tyneside, which Urban Splash is jointly developing with community-led funder, Places for People. Collaborative practice is something Cambridge-based Mole Architects embraces, having realised schemes for a variety of pioneering clients, from Solidspace (with which its Houseboat project won the 2017 Stephen Lawrence Prize) to Alain de Botton’s Living Architecture (working alongside Dutch practice MVRDV to create Balancing Barn in 2010). 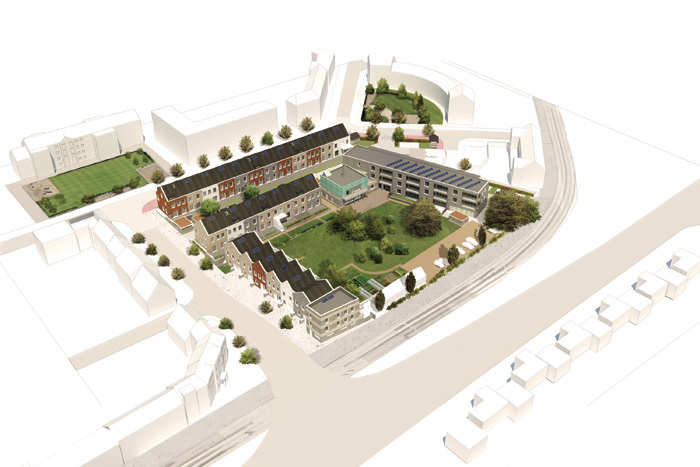 In Mole Architect’s new Marmalade Lane project, in northern Cambridge, founding partner Meredith Bowles jumped at the chance of working with an existing cohousing group to create 42 homes, with a high degree of customisation, for emerging urban developer TOWN, on a site the council had earmarked for cohousing, in response to petitioning by a local cohousing community. 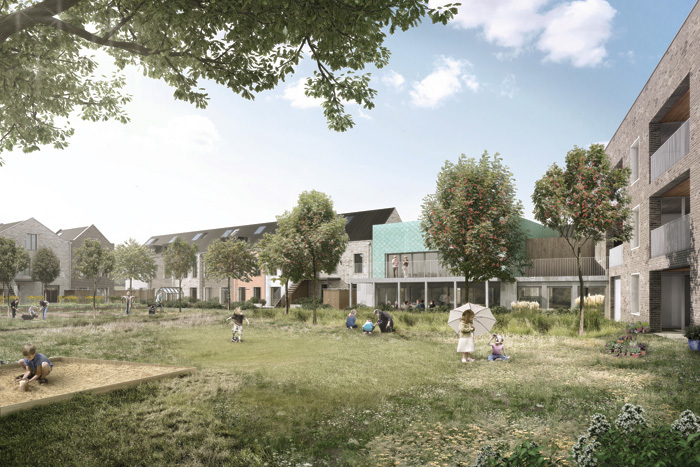 Four modular dwelling types have been developed, which are arranged in three rows of terraces with a mix of houses and flats, framing a massive shared garden with three huge, mature oak trees at its centre. 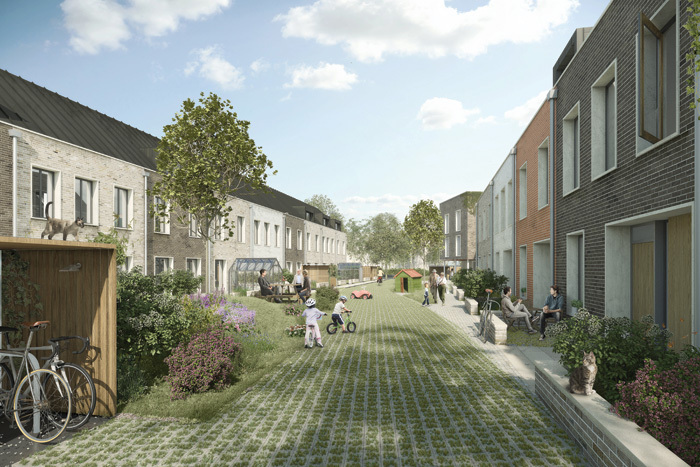 The cohousing community is truly multigenerational, and outdoor spaces reflect this with a shared, car-free lane for children to play in, and parking spaces focused at one end of the site to minimise traffic danger and encourage pedestrian circulation. A large, shared communal building, the Common House, sits at the entrance to the site, ideally sited for the elderly residents’ flats above it, served by a lift. The ground floor of the Common House has a large kitchen and enough space for 50 to sit down to eat; the idea is that they will eat together three times a week — though it isn’t obligatory. Upstairs there is a yoga/ meeting room and quiet lounge/study space, a laundry room and an additional couple of guest rooms for visitors. Individual houses range from 80 sq m to 128 sq m. Although the houses are being sold to the community at market value, there were discounts for those who had invested a huge amount of their own time in steering and supporting the project. The Marmalade Lane project will hopefully bring animation and heart to the local neighbourhood when it opens in September. Duncan Blackmore is a developer with a difference. His company Arrant Land finds disused, infill and overlooked sites then works together with a curated selection of architects — including 31/44 and Stephen Lawrence Prize-winner Denizen Works — to transform them into homes that enrich both the neighbourhood and their owners’ quality of life. 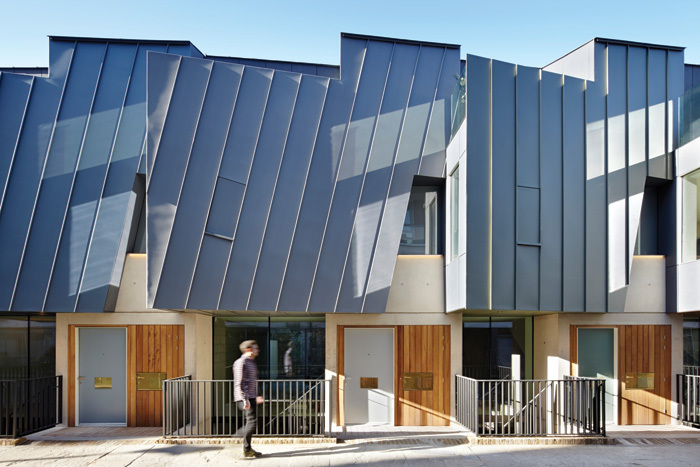 After building up capital through a few small, self-directed refurbishments, Blackmore was able to bring architects in to do something more ambitious. 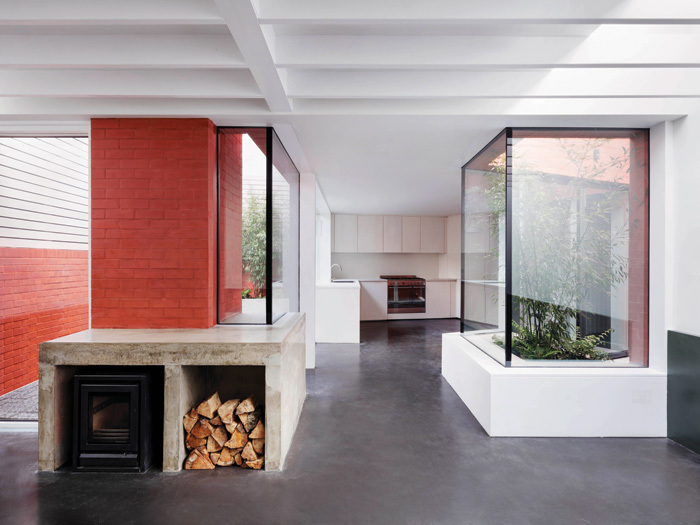 The Red House, developed in collaboration with 31/44 Architects, came about because an end-of-terrace location meant he could buy the existing house, refurbish it, and build a new one in its garden. It completed in 2017, as did Haddo Yard in Whitstable: a larger, more public-facing plot, opposite the main station, that was previously occupied by a bungalow. Here, Denizen Works created a thoughtful, craftsmanlike building that houses seven flats, transforming an inherited planning scheme into something far richer. 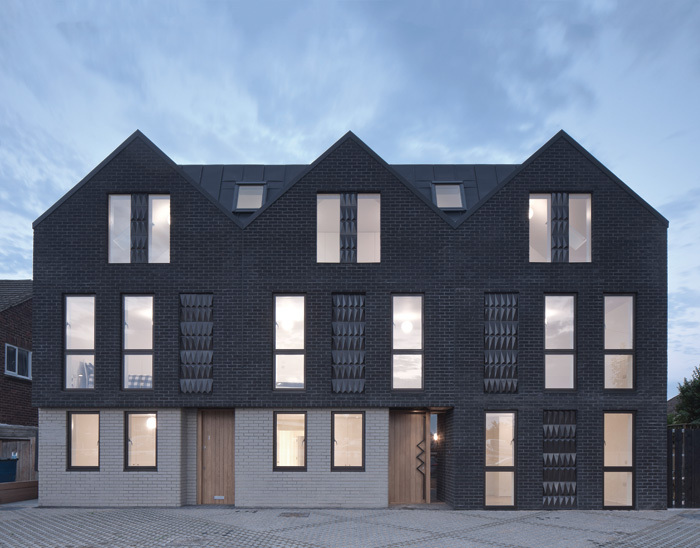 Exteriors evoke the colouring of local black-weatherboard fishing huts with sections of dark and light brick, while the form and scale mimic the adjacent shops and houses. Says Blackmore: ‘That project became an opportunity to really try and demonstrate what development could be, rather than what it is.’ He completed the 450 sq m project last July, for £800,000, having also started his own building company so he had better control over costs and quality. Pocket Living was set up in 2005 with a mission to create small but well-designed starter homes for the millions of young Londoners who couldn’t afford to get on the housing ladder. Designed for singles and couples, they are sold at 20% less than market rate, and offered to first-time buyers living in London and earning less than the mayor’s affordable salary cap (£90,000 a household). When the owners resell them, they have to honour that 20%-below commitment to the next buyer. More recently, Pocket Living has been mixing larger, market-rate apartments with affordable, to justify more ambitious schemes, but still promises a minimum of 60:40 (affordable to market). Pocket Living’s style is to find tight, urban plots for newbuild, or decent older buildings for refurbishments that yield between 21 and 70 apartments. It partners with good architects — among them Metropolitan Workshop, Haworth Tompkins, HKR and Dyvik Kahlen — to ensure that each unit delivers a certain ergonomic elegance within its 38 sq m footprint. Having dabbled with modular before, Pocket Living pushed the boat out this year, launching its first modular apartment block, Mapleton Crescent, designed by Metropolitan Workshop. 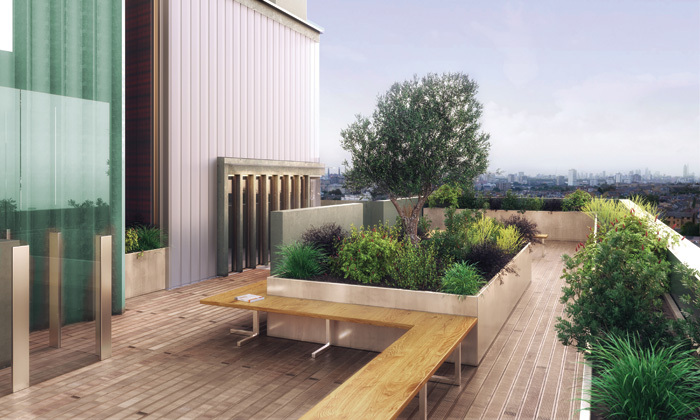 A roof terrace on the 25th floor of Mapleton Crescent is shared by all residents, with views out over Wandsworth. 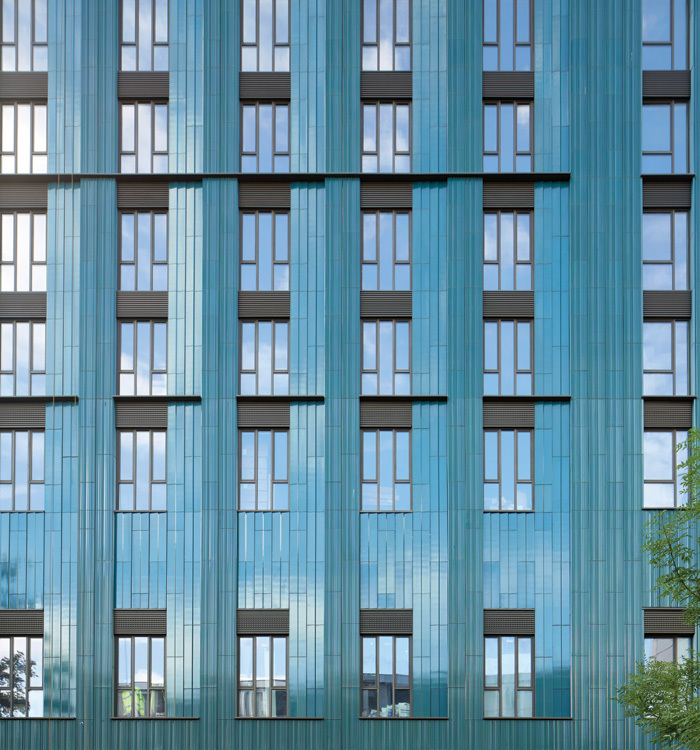 With its slender shape, another winning feature was cladding the building in unusual, ridged, grey-green faience tiles, whose exact aquatic hue was devised by ceramic artist Loraine Rutt, to reference both the river and the sky. 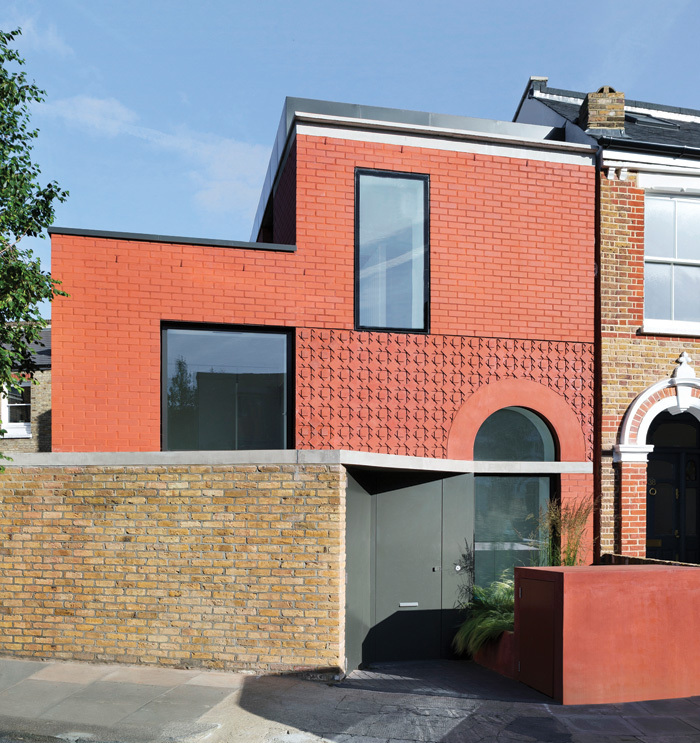 This final detail helped to win over the notoriously conservation-orientated Wandsworth residents, and secure planning. The construction took eight weeks, one storey a day, with 89 homes created from 243 units. Each apartment is made up of two conjoined storey-high units (three or four in the larger, market-rate apartments on the upper storeys). They arrive ready plumbed with bathrooms, tiles, windows, doors and wiring. The concrete modules act as structural frame as well as container. They are built in Bedfordshire by Vision Modular Systems, require 60% fewer truck journeys than conventional construction, and produce 90% less waste. The apartments inside this tower may be on the small side, but there are generous shared spaces to make up for it — a residents’ lounge on the ground floor, a roof terrace and a river terrace — and, most remarkable of all, an open staircase that gives the circulation space a domestic and sociable quality.